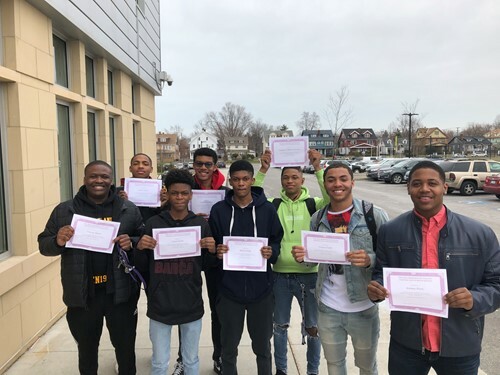 April 9, 2019 -- “This really gave them a taste of what it means to be a college student,” said Heights High guidance counselor Mike Murray of the MLK Morehouse Legacy Day that he and eight students attended at Tri-C on April 4. The students, all college-bound juniors and seniors, had the opportunity to meet and listen to a group of Morehouse alumni talk about their college years. Heights High was one of six high schools to participate, thanks to the district’s partnership with the MetroHealth School Health program, who cosponsored the event. Mr. Murray, who hopes to return next year with even more students, was struck by how much the men described college as a family. “They go into class with 700 like-minded individuals, all focused, all doing something positive as a family. It goes against everything the media portrays of young black men.” Morehouse is one of the nation’s most prestigious Historically Black Colleges and Universities (HBCUs). The Heights High students were also intrigued by the idea of attending a junior or community college like Tri-C first, both to save money and to be better prepared for the academic rigor they would find at a school like Morehouse. “Those men might not have had the best upbringing, but they still got there. We felt like we could really relate,” said Khalil.